I finally took delivery of my new Vampire 600 68080 accelerator, which I couldn't wait to get up and running on my Amiga 600! For those who follow my blog regularly, you will know that my Amiga 600 was featured in a "from scratch" build series of blog posts, covering all the various upgrades and OS build on it. You can do some catch up reading on the articles below if you want to know more about the hardware in this Amiga! This machine has had a lot done to it since I got it in 2014! With that, I fished out my Amiga 600 from storage (I don't have enough room to have all systems set up unfortunately), and hooked it up to make sure it still works. I am pleased to see all is well! Next I pulled the Amiga 600 apart in preparation for the Vampire 600 accelerator installation. As you can the Amiga 600 is already heavily upgraded internally. Please check my earlier blog post linked at the top of this post for all the details on these upgrades. So now I turn my attention to the Amiga 600 ultimate upgrade - the Vampire 600! Above, you can see the power and activity leds, fpga, hdmi port, micro-sd card slot, and expansion port. Some more closer views from different angles for those who want more detailed look. You can click on the images to supersize them to the original size. For the Vampire 600 build on my Amiga 600, I also bought some IDE to SD card converters from Ebay to allow me to use much more common SD cards on my Amiga 600, rather than the more expensive CF cards. I used my Windows 10 PC to download CoffinOS R51 (google for the link) which is designed to fit on a 32GB SD/CF card. I used Win32DiskImager to write the image to the MicroSD Card. It is Vampire ready setup of AmigaOS, with everything needed already installed and setup ready to use! Removing these screws from the ports on the back of the Amiga 600 is a real pain...but I got there. We then attached the long spacer on the screws, which is what the Vampire 600 board rests on. With that done, I have to put the tiny nuts on the ends of the two screws to secure the Vampire 600 to it's final position. Almost there, you can see the new IDE to SD card converter board is installed now too. I put the case back on and connected the HDMI port with a HDMI cable to connect the Vampire's Picasso96 RTG board (SAGA driver) to my screen and connect the Indivision ECS VGA output to the same display (I have both VGA and HDMI inputs. When I power on, the CoffinOS R51 boots up from the SD card and prompts me to immediately update the firmware on the Vampire to the latest version. I proceed with the V600 upgrade to the Gold release v2.9, the minimum needed for this build of CoffinOS. I was surprised the board didn't come with the latest release, but not a problem. Next I rebooted the Amiga 600 and greeted with a black and white boot screen. This is a good sign since it means the Vampire RTG is working and booting up, but unfortunately means that my specific Vampire 600 board needs a newer version of the firmware which has my registered Vampire serial number included in it. With AmigaAMP and Eagleplayer music players on the CoffinOS base build, there is plenty of options for audio enjoyment out of the box! The default resolution is 800x600x16bit, but you can of course bump that up to 720p if you desire. I note that the Trident (Poseidon USB) setup under CoffinOS does not have the required driver for my Subway USB card connected with the A604n expansion board. I will need to load the correct driver from icomp.de support site. The Vampire 600 has 128MB onboard memory, and combined with the A604N memory means I have 2MB Chip memory, and 128MB fast, which is great. I tested some RTG demos like Swansong which was included on the CoffinOS 32GB image, which previously I could only run on my Amiga 4000D/T with AGA chipset and 060 board. Runs very well indeed on the Amiga 600 now! As mentioned, I need to upgrade the firmware on the Vampire to a newer version - Vampire purposely reduces the display output to black and white for unregistered boards to fight counterfeit boards and people running unsupported/beta versions of the Vampire firmware. So I had to come up with another solution. I turned to my AmigaOne X1000, with it's catweasel X1000 hardware installed, which allows me to read/write native Amiga floppy disks under AmigaOS 4.1 Final Edition. However the firmware archive for the Vampire is much bigger than a standard 880k Amiga floppy disk. 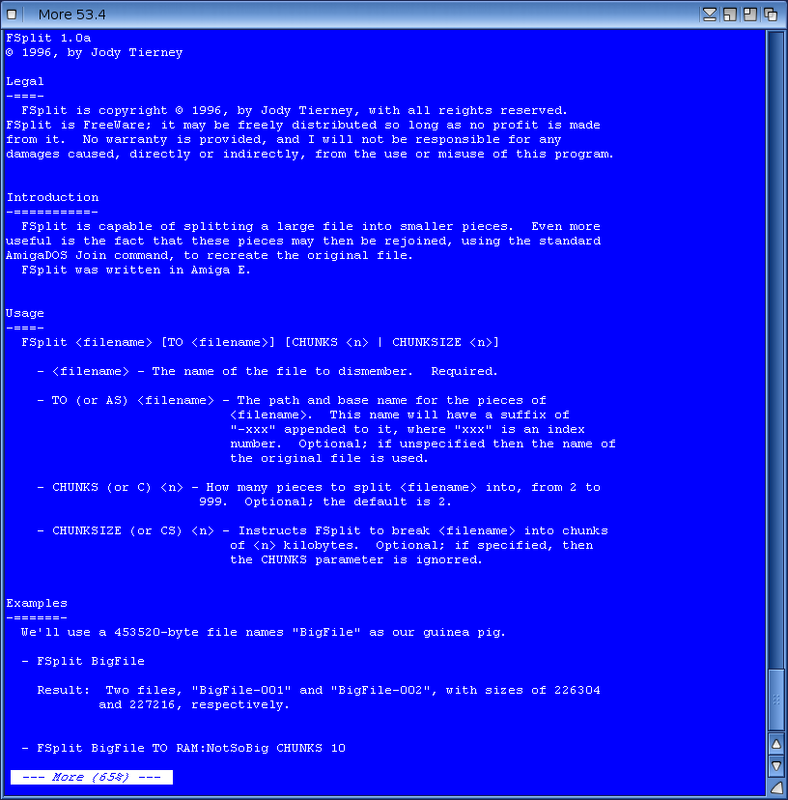 So, I downloaded fsplit from AmiNet, which is an OS3.x tool that runs perfectly fine natively on AmigaOS 4.1. 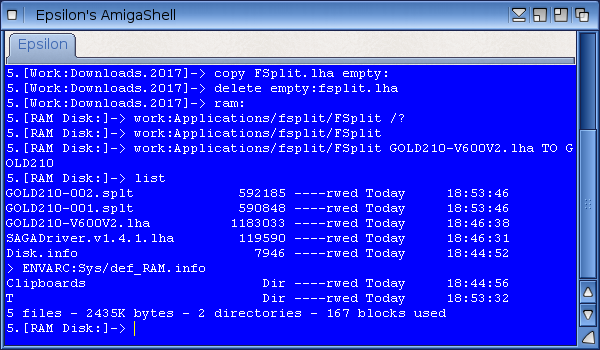 I then downloaded the latest Gold V2.10 firmware from the official Apollo Accelerator support page using my AmigaOne X1000, and used fsplit as below on the archive, which by default splits the file in two. The resulting two files can each fit on a single floppy disk, so I copied each file to a floppy disk, and then copied them onto the Amiga 600 hard disk! After another reboot, I now have an updated Gold V2.10 and more importantly, colour! After seeing everything in black and white for a few hours, it is great to use in colour finally! I could then enjoy more RTG demos that normally need an 060 AGA Amiga on my little Amiga 600, all thanks to the Vampire 600 accelerator! That concludes my build for now. Clearly there is a lot more to do, but it is exciting to finally have a Vampirized Amiga 600 here!